I could have picked any Edward Lee book for an All Hallows Read. Really. It’s all good. As far as Hell goes, I could recommend any of the City Infernal series. I could choo-choo-choose Black Train (a.k.a. Gast) for a creepy earth-bound tale. Monstrosity is another great one for budding crypto-zoologists. There is always The Bighead but that is getting enough press at the moment and really, I get to pick my favorite here. What more could a horror-hound want than a trip through Lee’s Hell with Howard Phillips Lovecraft as your guide? The amount of gore and perversion found in Lee’s work is more than enough to tickle your gag-reflex, should you still have one, and this one doles it out in spades. 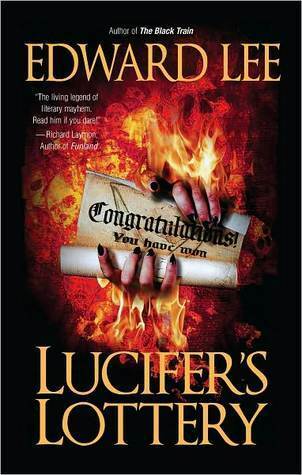 His books that feature Hell read like a Cenobite’s nightmare version of Hogwarts School of Witchcraft and Wizardry. But, you ought to see what they do to the Muggles there! Oh Mylanta! This is one for the sicko. The perv. The blasphemer. The reader who delights in illustrated pathology texts or Gnostic tomes but spends as much time watching Saturday morning cartoons. You know, for the anvil drops. It’s not all mutilated pubic mounds, effluent troughs, and burning bibles either. There are stories here. Even characters you meet for a flash are sketched so clear with intricate wording, you can’t help but adore even the most repulsive. And the bestiary! Well, that sort of crosses into the human and human-type characters too, depending. Fantasy for freaks. Science Fiction for sociopaths. If you are looking for something deeply disturbing with no holds barred page after page, this is your golden ticket. Today’s All Hallow’s Read recommendation is for the younger folks in your life, or maybe for the ones who are still young at heart. Give them something to read while they inhale sugar, and run around like loud, crazy hooligans. Or you could just give the book to a kid. 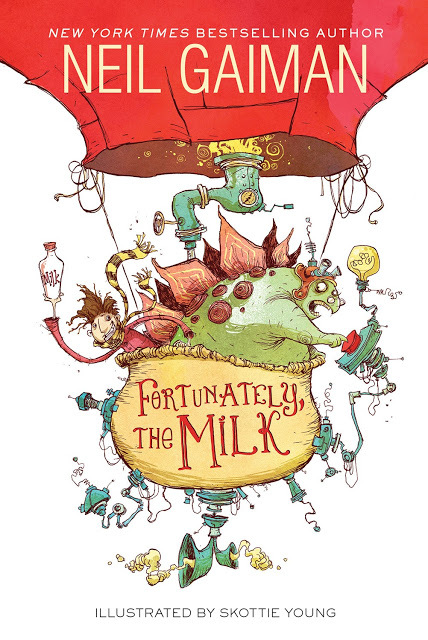 Fortunately, The Milk is the latest book by Mr. Gaiman himself, just released in September. The US version (which I have) is illustrated amazingly, frantically and a bit creepily by Skottie Young, whereas the UK version (which I will pay someone to smuggle overseas for me) contains the beautifully detailed and somewhat more traditional illustrations of Chris Riddell. 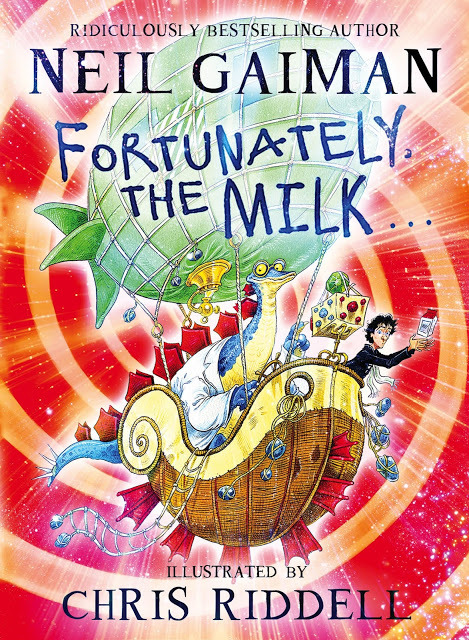 Gaiman has described this book as his silliest book ever, which he wrote for dads, and in which dads get to do all of the really cool things that they normally get to do on a daily basis. Gaiman has said that this is partly to make up for the oblivious father in The Day I Swapped My Dad for Two Goldfish. Now I can hear you thinking, “But Kendra, that book doesn’t sound scary at ALL”. But you’re wrong! It is absolutely terrifying. It starts off tragically, with 2 children facing the prospect of breakfast with nothing to put on cereal except orange juice. Their mother has abandoned them to go to a conference, and now they can’t even enjoy their Toastios. Heroically, Dad volunteers to go down to the shop on the corner to get milk. After an agonizing wait, Dad finally returns home, and begins the story of his dangerous and harrowing quest. Now, if you’re not scared yet, then you are a far braver soul than most, but just wait! That is only the beginning of Dad’s tale… before he opens the spaceship door, and lets the space-time continuum in. What then? Captured by pirates! Rescued by a time-travelling stegosaurus in a balloon! Captured by jungle dwelling people who plan to sacrifice him to the volcano god, Spold! Ponies, piranhas, aliens, and wumpires! And through it all, that crucial question: Can Dad hold on to the milk, and bring it safely back to his hungry children? So if you think that a child in your life can handle that kind of excitement and terror, then I strongly suggest that you give them Fortunately, The Milk this Halloween. And then you should probably read it too, to prepare yourself to soothe them when they wake from their nightmares of Toastios drowning in orange juice. Just make sure there is plenty of milk in the fridge for breakfast. Today’s suggestion is for all of the newbies to the genre. No doubt you came to our dark neck of the woods from Mystery, Thriller, Crime, or some other sort of speculative fiction genre, but have you ever faced a piece of writing that combines pretty much all of the above? 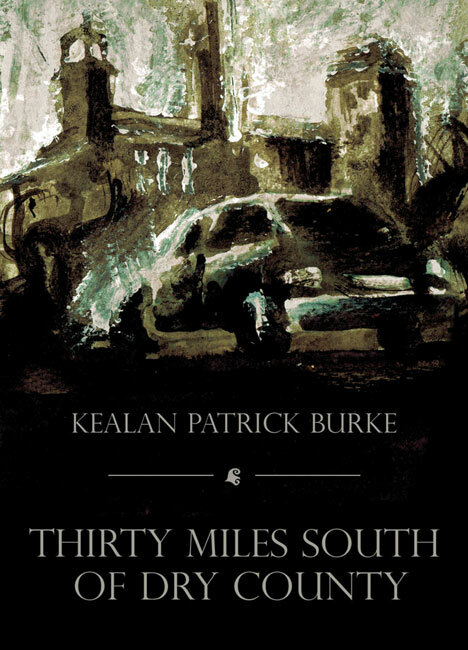 Thirty Miles South of Dry County is not only a brilliant foray into Kealan Patrick Burke’s unique style of storytelling, but it’s also an amazingly fun romp through a crazy, far-out-there, dystopian world that, well, isn’t actually too far-out-there. One of the greatest things about helping new readers along the path of finding great stories is that I get to throw my absolute favorite reads at them. 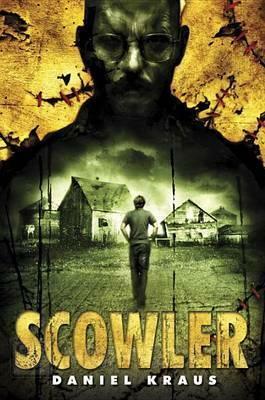 I read this novella when I was looking at the 2013 Stokers Finalists and, in all honesty, I think it should have won. …people who like their fiction short. Really short. 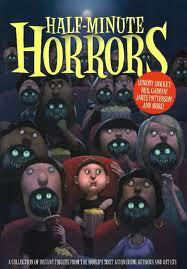 Fiction doesn’t come much shorter or more awesome than Half-Minute Horrors! This collection of super-short tales by a variety of well-known writers is aimed at kids around 10 and up. It’s also creepy as all get out! These little bites of literary terror even scared us a few times.